Thirty people, randomly selected, were stopped in the street and asked to name three composers of classical music. The three names which were most commonly suggested were Beethoven, Mozart and Strauss (which one was not specified). Another thirty people, randomly selected - possibly in a different street - were then given these three names and asked what they meant to the interviewees. The responses were, in order, a dog, a kind of chocolate and a brand of jeans. Whether that story is apocryphal or actually true (I heard it related during a discussion among concert promoters) is beside the point; it seems entirely credible. We live in a society where fame is measured in monetary wealth and press coverage, not in individual achievement or enduring legacy. Composers may be famous names among music lovers, but unless their names are associated with individuals or products which have made lots of money and receive regular column inches in the popular press, they are ignored by the vast mass of population. Ask thirty people in the street who Englebert Humperdinck is, for example, and few will suggest the orchestrator of Parsifal or the composer of Hansel und Gretel. Instead they will refer to an aging crooner, who earns a lot of money and can afford his own personal PR consultant. It was the movie PR people who also hi-jacked Beethoven’s name, giving it to an utterly unbelievable fictional dog immortalised on a series of mind-numbingly banal films. The trouble is a dog is more media-friendly than a dead, deaf and demented composer. And the fact that one Strauss was, for a time, associated with Hitler and Nazi Party and another part of such a huge family that few can tell one from another, the name lacks the kind of bland accessibility it gets when it is stitched on to an elaborate leather label proudly displayed (along with waist and inside leg measurements) on a brand of jeans which happily avoids any hint of anti-Semitism by linking Strauss with an archetypically Jewish name. Composers of classical music have rarely been wealthy and, even when they were (think Mendelssohn) lacked either the ability or the desire to manipulate the media to suit their own ends. They are, at best, peripheral figures, slightly weird in the minds of contemporary society in that they pursue careers which do not bring vast wealth and they pay no heed to their image. But there was one composer who bucked this stereotype. He was not only one of the richest men in Europe, but he also was an absolute master in manipulating the press. He it was, in the words of his biographer, who invented “the modern press conference with refreshments”. (As a journalist I’ve been to plenty of press conferences with refreshments and can tell you, they invariably work, leaving the assembled hacks feeling deeply enamoured of whoever has lavished such fine hospitality on them.) So who was this early model for the likes of, say, Richard Branson? The name was Jakob Beer. How many readers of this blog will have heard of a German composer called Jakob Beer? Perhaps if I point out that he moved to Italy where, in a remarkably media-savvy bid to ingratiate himself with the Italian public , he changed his forename to Giacomo, some will hear bells ringing in their heads. And when I recount how he linked the last two of his names together and settled in Paris, then quite a few will recognise Giacomo Meyerbeer as a vaguely familiar name in the annals of opera. Organists will know of him only because Liszt used a melody from one of his operas in his greatest organ work, the Fantasia & Fugue on Ad nos, ad salutarem undam, but I doubt whether concert-goers will know a note of his music. So what went wrong? Why has a man, who by all the standards of contemporary society should be among the most famous composers of them all, been all but forgotten by all except a handful of aficionados of Grand Opera? The Most Famous Composer of All Time? 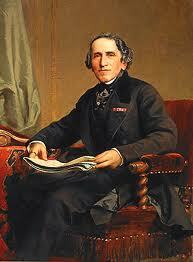 In every way, Meyerbeer was living in the wrong place at the wrong time. He focussed so much on the spectacular operatic performance popular in early 19th century France, that when it fell out of fashion, denounced as vulgar exhibitionism by its subsequent detractors and financially unsustainable, his reputation fell along with it and, far from being seen as a famous personality, loaded with moolah and high in the PR canon, he is regarded as a miserable remnant of a discredited society where outward appearance took precedence over inner substance. Might there be some lesson to be learnt from Meyerbeer’s sorry demise? Gee, Meyerbeer couldn't have been forgotten because Wagner trashed the man and his career in his screeching scumbag anti-Jewish polemic, "Das Judenthum in der Musik", even though Meyerbeer did nothing to the dirtbag but help get Wagner's first opera staged. And what does Wagner do in return? Well, what any petty scumbag lowlife does: He trashed Meyerbeer unmercifully by inference and Mendelssohn BY NAME in Das Judenthum in der Musik, simply because they were Jewish and he was malevolently jealous of their success and popularity. Meyerbeer's operas aren't any more vulgar than any other opera before or since. They aren't any more concerned with appearance than substance, either. Wagner needed to look in a frickin mirror considering how padded and bloated his garbage is, not to mention how it's parsecs wide, but picometers deep. That's sort of the working definition of appearance over substance, you know. I get so worked up when I have to think about Wagner trashing people simply for being Jewish that I forget words, how to spell--everything. I always enjoy reading your blog, particularly when your well argued and forcefully expressed views differ from my own. This posting was therefore especially enjoyable. I was puzzled by your opening salvo, that "fame is measured in monetary wealth and press coverage, not in individual achievement or enduring legacy". Press coverage (or literary references, internet search hits etc) might be a fair measurement of fame, almost by definition; and "fame" stems from a name being "familiar" to many. But monetary wealth, achievement and legacy are surely not measures of fame; they are reasons for the fame, and there may be others... controversial behaviour, tragedy, luck, good looks, bizarre views and so on. I also struggle with your claim that Mozart "will never be famous... because he was famously not rich". Firstly, I suggest that Mozart is about as famous as a classical composer can be (in your story he was in the top 3), and secondly that most non-music-minded people will neither know nor care whether he was rich or poor. Van Gogh is undoubtedly famous, and also died in abject poverty, yet this has not affected the popularity and prices of his paintings. So did Chippendale, while his furniture sells at incredible prices. And Socrates must be doomed to obscurity once people discover he owned nothing. The eponymous brand of chocolate was so named precisely because of Mozart's fame, in a bid to make some money out of it. This is common. There is Van Gogh vodka. My children recognise Baby Einstein videos, but are too young to know about the physicist, but that does not for a moment detract from his fame. Give Beethoven the dog a few years and he will be virtually forgotten, unlike the composer. Will a group of hunky male dancers be remembered in a decade, and will collectors be paying even more millions for their Chippendale chairs ? One day, will people associate the name Churchill with car insurance or a wartime prime minister. And will the name Raffles be associated with a colonial administrator, or Business Class seats on an airline ? (Spare a thought for poor old Willie Farquhar, who did most of the early planning of Singapore, but has had no schools, clubs and roads named after him: his name is just too easily mispronounced !). And I feel obliged to point out you are completely wrong about Levi Strauss. Admittedly, the famous anthropologist Claude Levi-Strauss has a greater claim to feel usurped than Richard or either of the Johanns. But the truth is much simpler: the company making denim jeans was set up by an German-American Jew, named.... Levi Strauss. I think you are also pointing out that fame is awfully unjust, and that I would agree with. Christopher Columbus is famous, for doing something he didn't do (discover America) by mistake, while trying and failing to do something else (get to India by going west). He even has a country named after him, that he did not discover, or even visit. He does have an enduring legacy in Europe - not all good: potatoes, chilli, tobacco and syphilis. Was he great, successful or just famous ? And (without checking) does anyone know whether he got wealthy through all this, or did he die of scurvy ? And behind that is something else that I thoroughly agree with: that our obsession with financial wealth easily eclipses all else. This is not just our society, or our culture, or our time, it seems to be a consistent human trait for as long as we have records. Though, oddly, most societies also have religions and creeds which preach that inner wealth is more important. But this is generally ignored, even by those who preach it. By falling back on the assumption that everyone is pursuing financial wealth, we conclude that it is the primary measure of success, and therefore quality, excellence, even greatness. And of course it isn't. Your Meyerbeer example shows how the ephemerality of popular fame. Take today's celebrities, maybe Psy, Adele, Justin Bieber or David Bowie (four singers in recent headlines). Can anyone say whether in 10, 50 or a few hundred years, their music will be venerated, popular, or even remembered at all ? Whatever the answer, I suggest it will be more to with the music, and less to do with their current fame and financial wealth. Will people still listen to Richard Clayderman, or will they hear pieces by the composer De Senneville, and in a footnote read that they were first popularised by a long forgotten pianist named Pages, who performed under the name Clayderman, and that their naive and simplistic charm was for a while highly controversial among musicians. Your observation on Meyerbeer puts even the stunning financial success of Andrew Lloyd-Webber in the shade. You point out that he bucked the trend of most composers (and, one might add, poets, artists, writers, playwrights and so on), and was hugely successful financially. But while he was an extreme case, was he not just part of a spectrum of composers who pursued their craft for various reasons ? Art for arts's sake at one end, and art for money at the other. And art for fame and popularity in the middle. Meyerbeer may have fallen out of fashion after his death, but if he was just after the money, then this is hardly a problem. But I do find it interesting to speculate whether this is part of a general trend: the art for money composers fade over time, and the art-for-arts's sake grow in stature. To match Meyerbeer, there is Mozart or Schubert, to match Dali there is van Gough. The person who said "the first shall be last, and the last shall be first", was not financially successful nor particularly famous in his lifetime, yet has left an enormous lasting legacy. And, ironically, the foundation of several of the richest organisations in the world today. Sorry, that has become more of a stream-of-consciousness rant than I intended.